Sauternes and foie-gras; heaven or cliche? In food and wine matching (as in much else in life) it’s often tempting to jump to some fairly clichéd conclusions. Lamb, so they say, is best matched with either a red from Bordeaux or Rioja. Barbecued meats sing out for a hefty Aussie Shiraz and the punchy flavours of a Thai seafood salad are best accompanied by a glass or two of zesty Riesling. By the same token, sweet wines are relegated to the dessert and cheese courses. The one exception is Sauternes (and other sweet whites from the Bordeaux area), which, in the universe of culinary clichés, is paired with foie gras as frequently as it is with pudding.A few weeks ago I attended a cliché-busting lunch at London’s Le Cercle restaurant. The aim of the exercise was to put a number of affordable Bordelais sweeties through their paces in order to prove that they deserved a place on the dining table throughout a meal. I have to admit I was sceptical – a touch of residual sweetness can work well with the fiery spice of Asian cuisine, but the idea of a marriage of sweet and savoury in the context of a French meal seemed slightly odd. The first dish we were served was one of fennel confit with an orange vinaigrette and a salad of rocket and fennel shavings. This was paired with a Premier de Loupiac 2004 (£5.99 for 37.5cl, Oddbins), which had pronounced aromas of orange zest and a touch of aniseed on the finish, flavours that complemented those of the dish extraordinarily well. Having said that, had it not been for the fact that the slow-roasted fennel had the slight caramelisation that comes from long cooking and that the slightly spicy orange dressing contained a certain amount of sugar, the match would not have been so successful. The pairing was also assisted by the fact that the wine itself was not overly sweet, with lots of good, fresh acidity. The next course was, perhaps, the most predictable: a dish of foie gras confit with a layer of fruit jelly and a lemon granita paired with a choice of two wines, the Château de Cérons 2001 (£16.30, Nicolas) and a the Château Crabitan-Bellevue Sainte Croix du Mont 2001 (£7.99, EH Booth). The wines provided quite a contrast as the Cérons, although richer and weightier, had far more acidity and minerality than the Saint Croix, which seemed heavy and cloying in comparison.Perhaps I should put my cards on the table here – I’m no great fan of the foie gras-Sauternes combination. I find it to be an embarras de richesses and would far rather pair the already rich and unctuous foie with a wine that has less residual sugar or a higher degree of acidity – my choice would be something like a vendange tardive Riesling or a moelleux from Jurançon. A rich Chardonnay can even do the job well. Unsurprisingly, I found the Crabitan-Bellevue to be too hefty to work satisfactorily with the foie gras – rather than cleansing my palate, it left it feeling clogged with an unattractively sweet, fatty residue. 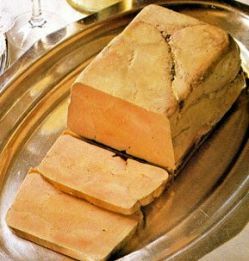 The lighter, more complex Cérons fared rather better, thanks to its balance and cleansing acidity, but ultimately was dominated by the rich liver and fruit jelly. We moved on to a dish of roast quail, accompanied by an apple and quince purée, a sticky balsamic reduction and grapefruit. This was the match of the meal, the sweet-sour sauce and fruit complementing the quince and spice fruit of the Baron Philippe de Rothschild Sauternes 2001 (£8.50 for 37.5cl, Selfridges) – the wine and food not only harmonised elegantly, but enhanced and prolonged each other’s flavours. A three-part dessert followed: an open ‘ravioli’ of fruit in which two thin slices of mango sandwiched a tropical fruit salad, a cold rice fritter filled with a coconut-flavoured iced liquid and an intensely flavoured mango mousse served in a coconut ‘snap’ biscuit cup. The wine chosen to partner this sweet trifecta was the ripe, concentrated Château Haut Bergeron, Sauternes 2003 (£9.98 for 37.5cl, Asda). As you might expect with a wine of this vintage, the Sauternes was rich and syrupy, with plenty of tropical fruit and candied mango. The tartness of the fruit raviolo jarred with the wine, bringing out a trace of bitterness on the palate, but both the fritter and the mousse were superb matches, harmonising well with the intensity of the wine.So, at the end of the day, have my prejudices been overturned? Well, yes and no. I have to admit that, in some cases, the sweet wines did a far better job of partnering savoury foods than I had expected – but I still have a couple of reservations. The first is that the most successful dishes were those in which the savoury flavours had been adjusted or balanced by a sweetness and degree of fruitiness in the sauce or accompaniments, and I’m not sure that most of us eat dishes like that all too often (with the exception of gamey fowl such as duck or quail, which are often served with fruit). My other objection is that I just don’t want to drink sweet wines all the way through a meal, nor do I want to drink them too early in a meal as it can be difficult to follow a sweet wine with a dry wine, whether white or red. And I still remain to be convinced that the pairing of Bordeaux’s sweet whites and foie gras is anything other than the most unmerited of culinary clichés. At least Rioja and lamb work well together.